The Coslys Organic Cleansing Gel for Sensitive Mucosas is specially for women's intimate hygiene and having regular problems of irritation or discomfort sensations. Free-fragrance, its ultra-mild pH 8 formula is rich in magnesium, limiting the proliferation of mycosis and responsible of fungal infections. COSLYS Organic Cleansing with Calendula gently soothes sensitive mucosas and helps keeping intimate balance ! Takes care of regular intimate problems with The COSLYS Organic Cleansing for Sensitive Mucosas ! Apply Coslys Organic Intimate Cleanser 2 times a day during 21 days when you have periods of discomfort sensations. Use like a liquid soap and rinse with clear water. External use only. 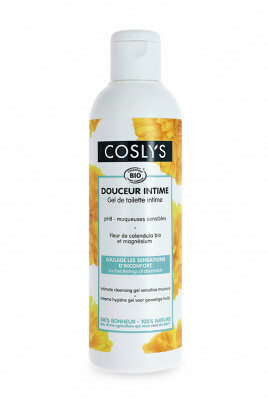 For the daily intimate hygiene, you can also use COSLYS Organic Intimate Cleansing Gel. Rich formula with magnesium to take care of your intimate hygiene ! Aqua, spiraea ulmaria flower extract*, sodium cocoamphoacetate, sodium coco-sulfate, glycerin, polyglyceryl-2 laurate, calendula officinalis flower extract*, sodium lactate, magnesium PCA, decyl glucoside, coconut alcohol, caprylyl/capryl glucoside, sodium benzoate, lactic acid, sodium sulfate, potassium sorbate, benzyl alcohol, dehydroacetic acid, sodium chloride.